Do you love luxury living? Do you want some of the most breathtaking views of downtown Minneapolis? If you are shaking your head YES then the 39 story art deco inspired condo high rise, The Carlyle, could be the next place you consider calling home. 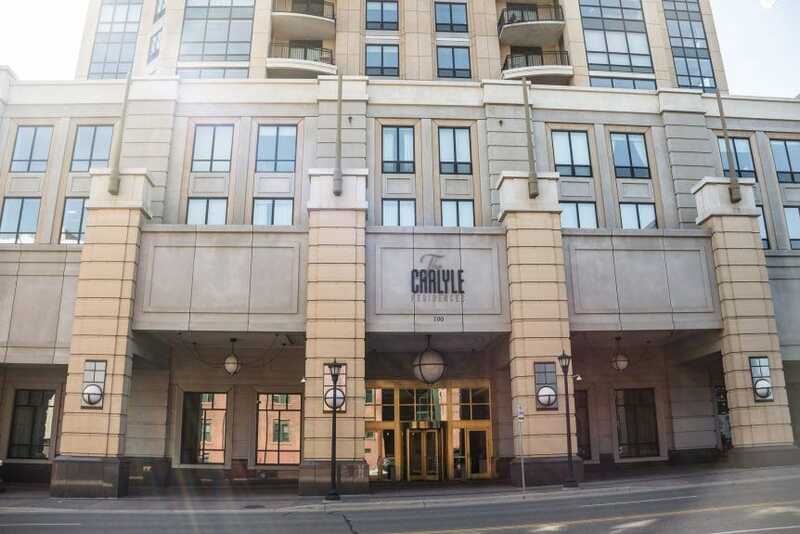 Located in The Mill District, The Carlyle is close to: all of the action in Minneapolis, the Mississippi River, skyway, and parks and trails. Urban professionals love The Carlyle because of its proximity to both work and play. It also has easy access to the riverfront which hosts amazing paths for running, walking, and biking. The necessities are also in arms reach with both Whole Foods and northeast Lunds & Byerlys being a stone’s throw away! If over the top luxury amenities are high on your list, then The Carlyle definitely won’t disappoint. Below are some of the stunning perks available to residents. The Carlyle offers a range of different unit types. You can find 1 bedroom 1 bathroom condos selling around the $350k-$400k range, then step up to 2 bedroom 2 bathrooms for $450k-$900k+, and finally you can buy a 3 bedroom 3 bathroom for $1.5M+. The Mill District is a part of the Downtown East neighborhood which borders the Mississippi River and is home to the iconic Stone Arch Bridge. Home to several cultural buildings, such as the Guthrie Theater, Mill City Museum, and the MacPhil Center for Music, residents can walk to see a variety of art performances! The Carlyle residents are also within walking distance to great restaurants like Kindee Thai, Sea Change, and Bushel & Peck. 1. Common, domesticated house pets such as dogs, cats, fish or birds (“pets”) may be kept by a resident in his/her Unit, subject to these Rules and Regulations. No other animals may be kept or used anywhere on the Property. Birds, fish and other small household pets (other than dogs and cats) shall be kept in appropriate cages or tanks in the Unit. 2. A maximum of two dogs or two cats, or one of each, may be kept in any Unit. 4. Owners are responsible to pay for any damage to the Property caused by pets housed within such Owner’s Unit, and are obligated to hold harmless and indemnify the Association, and its officers and directors, against any loss, claims or liability arising out of any act of the pet. 5. Pets are not allowed to relieve themselves on the Property, except for certain pets, such as cats or birds, within the responsible Owner’s Unit. For the purposes of this Rule, the Property is defined as the building interior, and exterior of The Carlyle and The Carlyle Commercial Space including the Porte Cochere, sidewalks, and landscaping elements. Owners or other handlers are responsible for prompt clean-up of pet waste. In the event that pet waste is not promptly cleaned-up by Owners or pet handlers, the current clean-up fee ($50 per instance at this time) will be charged to the unit. 6. Pets, with the exception of qualified ‘service animals,’ are not allowed in the party room, wine room, catering kitchen, board room, fitness center, spa area, or amenity deck. 8. Notwithstanding the foregoing, no Rules shall be imposed which restrict the keeping of a qualified “service animal” for a disabled or handicapped person in violation of any applicable state or federal statutes, regulations or rules. However, service animals are subject to the same behavioral standards as similar types of pets. involved threats to personal safety or to property. Accordingly, the following Rules apply to Owners who lease their Units, and to their lessees. Browse all available Carlyle condo listings and contact a Pro Team agent to schedule a showing.